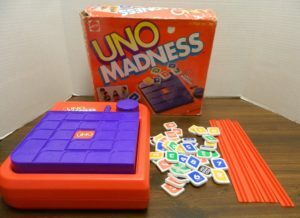 Two of the most popular board games to come out of the 1970s were probably UNO in 1971 and Perfection in 1973. These two games were popular enough that they are still in production to this day. From the 1990s to the early 2000s, Mattel was working hard to try and expand their UNO franchise. 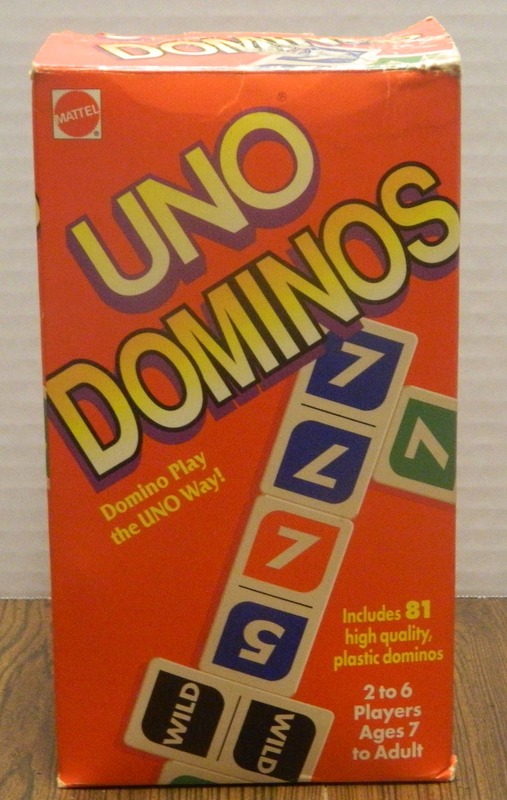 This lead to quite a few spin-off games being released which combined the basics of UNO with other popular game mechanics. One of those spinoff games was the game that I am looking at today, UNO Madness. 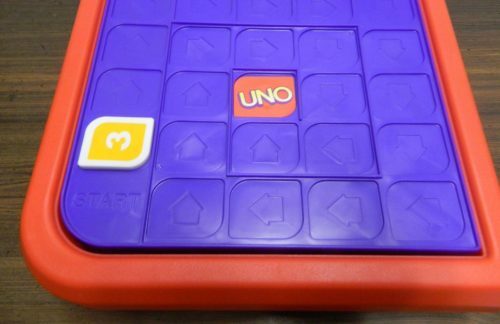 Despite not having the legal rights to Perfection, Mattel decided what UNO really needed was a gameboard that would pop up after a given amount of time just like Perfection. UNO Madness is what you get when you combine UNO with Perfection, a disappointing game that is worse then both of the original games. Place the gameboard in the center of the table. Grab a piece of paper and something to write with in order to keep score. Each player takes a tile rack. Place all of the UNO tiles in a face down pile. Each player draws five tiles and places them in their rack so only they can seen them. Flip the on/off switch to off and wind the knob as far as possible. Press down on the playing field until it locks into place. The youngest player will start the first round. UNO Madness is played in rounds. Each round begins with the current player grabbing a tile from the center pile and placing it on the first space of the gameboard. If the tile is not a number, it is returned to the pile and another tile is drawn. The timer switch is then switched to on and the round begins. The player to the left of the player who drew the tile will start the round. The gameboard has been set up. The first player will either be able to play a three tile, a yellow tile, or a wild tile. The tile matches the previous tiles’ color. For example a blue five can be placed after a blue one. The tile matches the previous tiles’ number. For example a red two can be placed after a green two. The tile matches the previous tiles’ word. For example a blue reverse can be placed after a red reverse. A wild tile can be played after any other tile. If the current tile was a green three, the current player could play a green six. If the current tile was a green five, the current player could play a blue five. If the current tile is a green skip, the player could play a yellow skip. When a player has found a valid tile that they can play, they place it on the next space on the gameboard. They then say the word “madness” which indicates the end of their turn. Play then passes to the next player clockwise. If a player is unable to find a valid tile, they must draw a tile from the draw pile. If this tile can be played, the player can add it to the gameboard. If it can’t be played, the player adds it to their tile rack. 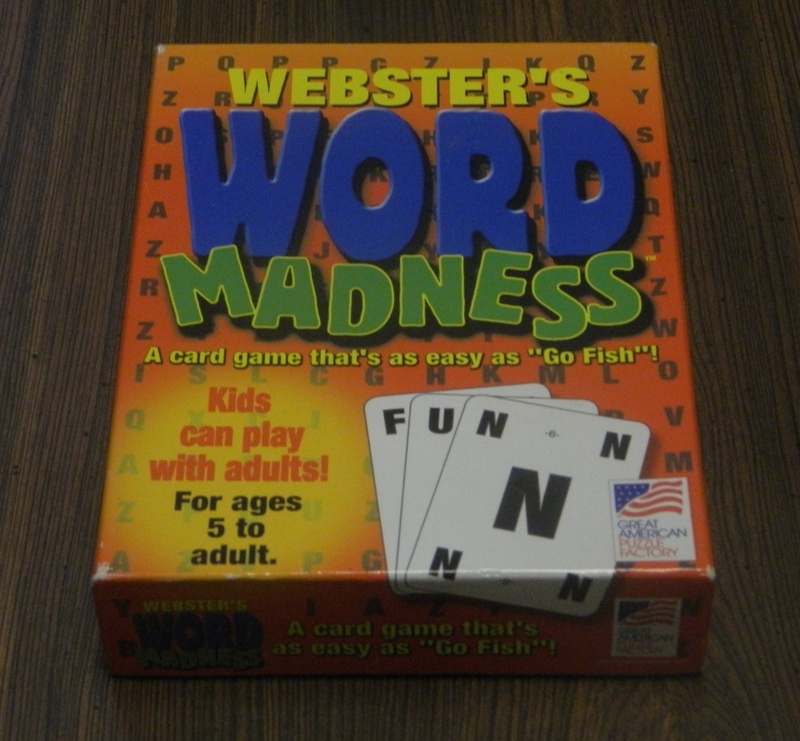 In either case the player must say “madness” to end their turn. When a player has only one tile left in their rack they must say “Uno” when they place the second to last tile. If they don’t say Uno and someone catches them before the next player takes their turn, they must draw two tiles from the draw pile. If a player ever makes a suggestion to another player of what tile they should play, the player making the suggestion has to draw four tiles. When the timer runs out, the gameboard will pop up. Whoever is the current player will face a punishment. In situations where it is hard to determine who is the current player, the current player does not switch to the next player until the current player says madness or Uno. Whoever is the current player when the gameboard pops up is forced to take four tiles from the gameboard. The rest of the tiles are added face down to the draw pile. The current player randomly chooses a tile from the draw pile (has to be a number) and adds it to the first space. The gameboard is reset and play then passes to the next player. The gameboard has popped up. 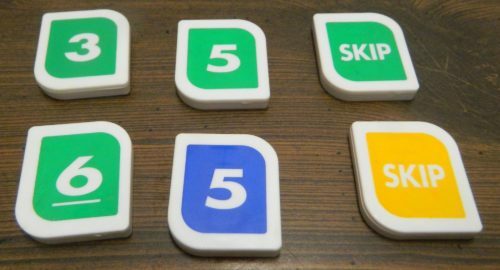 The current player will have to take four tiles from the board. The gameboard is then reset and the round continues. When most tiles are placed, no special actions are taken. There are a few special tiles though which require a special action to be taken. Draw Two: The next player has to draw two tiles from the draw pile. The next player also loses their turn. 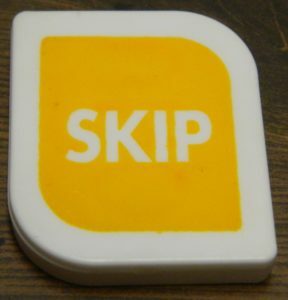 Skip: The next player loses their turn. 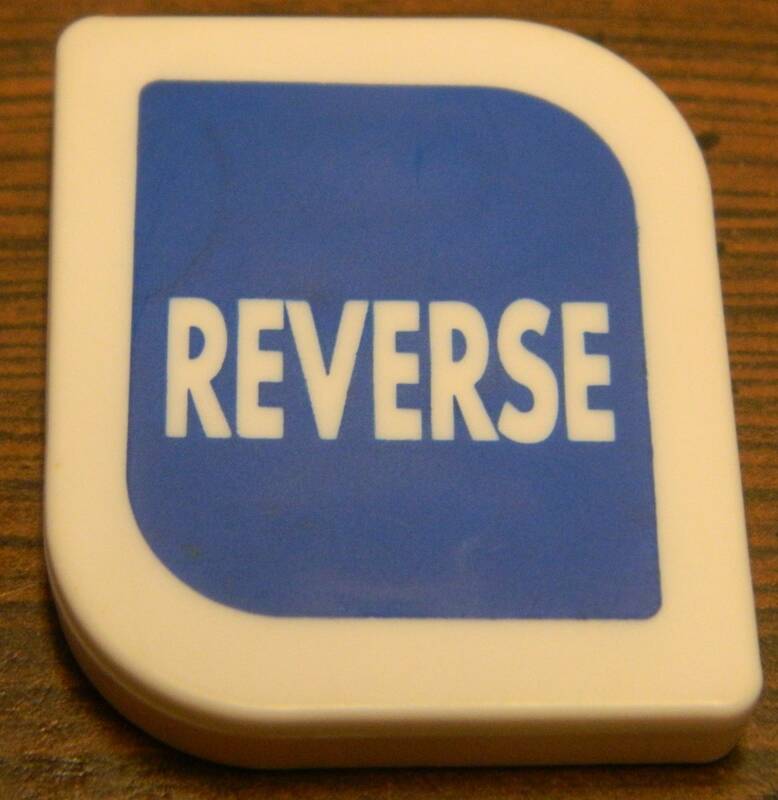 Reverse: The current turn order is reversed. If the turn order was clockwise, it is now counter-clockwise (or vice versa). 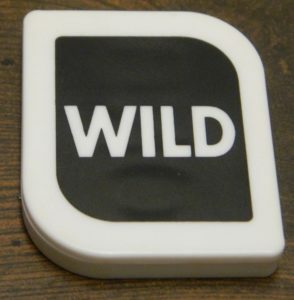 Wild: A wild tile can be played after any other tile. The player who plays the tile gets to pick the new color before play passes to the next player. 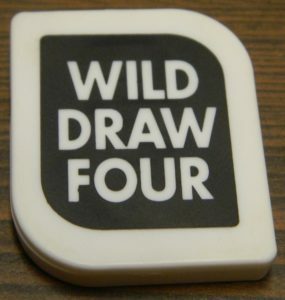 Wild Draw Four: This tile can be played after any other tile with some restrictions. The current player gets to pick the new color. The next player will have to draw four tiles and will lose their next turn. A Wild Draw Four can only be played if the player had no other valid options. If any player thinks someone played a Wild Draw Four when they had other options, they can challenge the play. The timer is stopped and the player who played the tile has to show all of their tiles to the challenging player. If it is determined that the player had no other choices, the challenging player has to draw two tiles. If the player incorrectly played the Wild Draw Four tile, they return the tile to their hand. The player loses their turn and has to draw four tiles. The timer is then started and the round continues like normal. One of the players play their last tile. This player has won the round. A player is able to play a tile to the last space on the gameboard. The player who played the last tile, wins the round. A player was able to play a tile on the last space. The player that played this last tile has won the round. At the end of the round the other players had the following tiles left in their hands. The winning player would score 13 points (5+8) from the number tiles, 40 points (20*2) from the Reverse and Draw Two, and 50 points from the Wild Draw Four. The player would score a total of 103 points from the tiles. If none of the players have scored 500 or more points, another round is played. The first player to score 500 points wins the game. 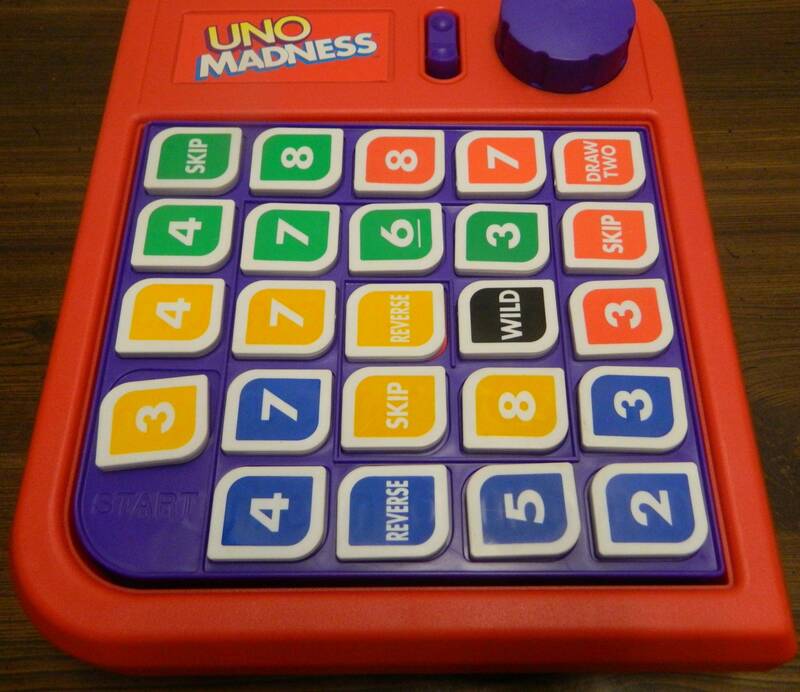 While it was kind of a strange combination, I was kind of interested in seeing what UNO Madness would play like. I know there are a lot of people that despise UNO but I have always had soft spot for it. I recognize that the game is flawed and relies almost entirely on luck. I like UNO for what it is though, a simple straightforward card game. While I am not a huge fan of Perfection, it is one of those games that is occasionally fun to play. The reason I was interested in UNO Madness is that I was curious how these two games that have very little in common would work together. I thought the game had potential if the designer could come up with a good way to combine the two games. Unfortunately UNO Madness wastes that potential. After playing UNO Madness, I honestly think the only reason the game wasn’t called UNO Perfection is that Mattel didn’t have the rights to Perfection. Basically UNO Madness is what you get when you combine UNO with the gameboard from Perfection. Instead of playing card, players place tiles on the gameboard. Otherwise the gameplay is mostly the same as the original UNO. You play tiles that either match the color, number or word from the previous tile. The gameboard is mostly used to add some speed mechanics to the original UNO. The gameboard forces you to place your tiles as quickly as possible, as you don’t want the gameboard to pop up on your turn. I am usually a fan of adding speed elements to UNO. I particularly liked the speed mechanic introduced in UNO Flash. I just don’t think the speed mechanic really works for UNO Madness. It feels like the mechanic just adds more luck to UNO, a game that already had a high reliance on luck. The gameboard ultimately adds two new mechanics to UNO. The most relevant mechanic is not wanting to get stuck with the gameboard popping up on your turn. If the gameboard pops up on your turn, it means you will be forced to draw four tiles. You don’t seem to get as many tiles as cards in the original game, so being forced to take four more tiles is a pretty big punishment. For the most part getting stuck with the gameboard popping up on your turn is pretty random. You can have a feeling that the gameboard is about to pop, but there is not a lot you can do to prevent it from happening on your turn. Early in a round you can choose to waste a bunch of your time which limits the amount of time your opponents will have. This could backfire on you though if play gets back to you and you are stuck drawing tiles. Basically the only way to handle this mechanic is to try and play your tiles as quickly as possible to try and avoid it. The one unique thing that this mechanic introduces to the game, is that it seems like the player who is forced to take the tiles gets to choose which tiles they want to take. The rules only state that the player has to take four of the tiles on the gameboard. This means they should be able to take the tiles that they think will be useful. This actually presents an interesting decision for the player. If there are a lot of special tiles on the gameboard, the player is going to be enticed to take them. These tiles will give the player more power which should make it easier to catch up. At the same time though, the special tiles are worth more points to the winning player so you might not want to potentially give another player a lot of points. This could be an interesting decision as it has the potential to be high risk high reward. The other mechanic that UNO Madness adds to the original game is another way to win a round. In the original UNO, the only way to win a round was to get rid of all of your cards. In UNO Madness you can also win a round by playing a tile to the last space on the gameboard. I personally don’t think this is a good addition to the game. The main reason I don’t like the mechanic is that luck is going to be the sole factor deciding who gets to play the last tile. First you need to have a tile that you can actually play. Then you need to actually get an opportunity to play it. The original UNO also relied on a lot of luck, but something about winning a round in this way seems off. The good news is that you don’t have to worry about this mechanic very much. Based on my experience playing the game, this mechanic is not going to come into play very often. This is due to a couple factors. First before a player can play the last tile, one player will likely have already gotten rid of all of their tiles and thus already won the round. You also don’t have a lot of time to play all 23 tiles necessary to win in this way. In order to play 23 tiles in time, there has to be next to no interruptions. Players have to quickly play their next tile and players can rarely draw tiles. A couple times we got a couple tiles away from ending a round in this way, but we were never able to quite get all 23 tiles played in time. One area I was a little impressed with UNO Madness was the components. The cards from the original UNO were replaced with tiles for UNO Madness. I like the tiles because they are made of pretty thick plastic and thus are durable. The artwork is just painted on the tiles which means it could fade off, but I think the tiles should be fine as long as you take care of them. The biggest problem I had with the tiles is that there are significantly less of them than the cards you get in the original card game. 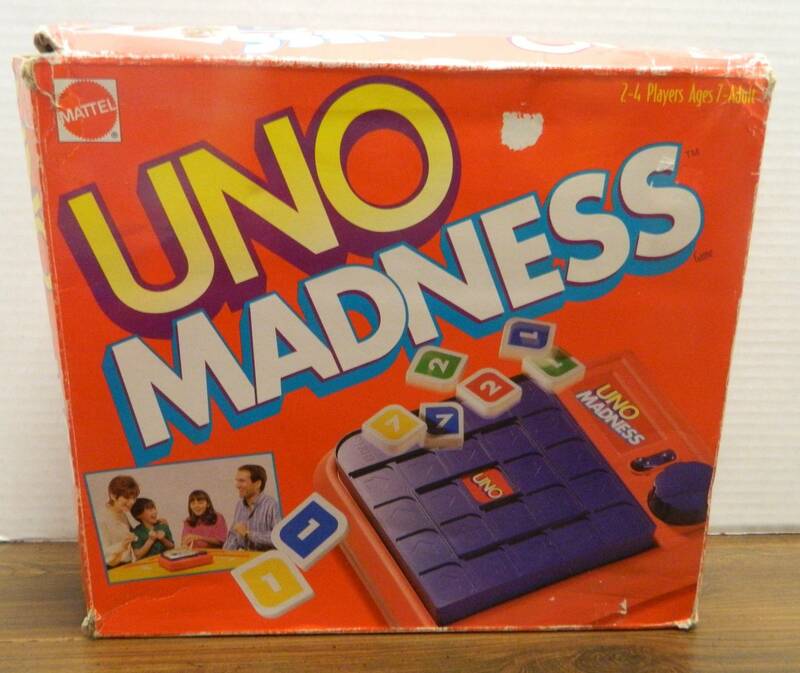 The original card game has 108 cards and you only get 43 tiles in UNO Madness. This is probably due to the fact that you never have as many tiles in UNO Madness as cards in the original game. It just feels like something is missing when players don’t have a whole hand full of cards. One of the biggest problems that I have always had with the original Perfection is that the timing mechanism rarely works as intended. Most gameboards for Perfection just seem to wear out over time which leads to the timer never working properly. Maybe I was just lucky with my copy of UNO Madness but this doesn’t seem to be nearly as big of problem for UNO Madness. I attribute this to the gameboard being more sturdy and thus constructed better. 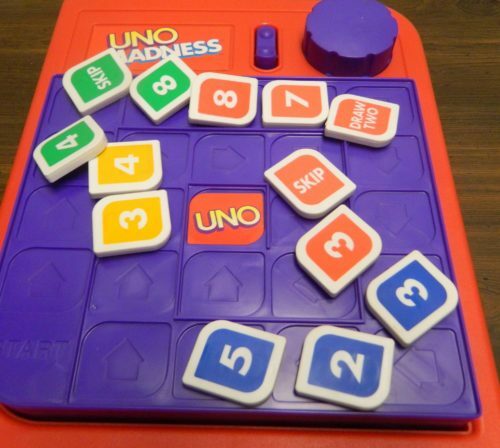 I am guessing there are plenty of UNO Madness gameboards that have stopped working, but I think they should hold up better than most Perfection gameboards. At the end of the day UNO Madness is not a terrible game. You can have some fun with the game if you like UNO and are looking to add a speed mechanic to it. The problem is that the combination of UNO and Perfection just doesn’t work that well. On their own, both games are fairly fun. Combined together though, you get a game worse than its parts. I honestly would rather just play UNO and Perfection by themselves than play UNO Madness again. Should You Buy UNO Madness? UNO Madness is basically what you would get if you combined UNO with the gameboard from Perfection. Although it was a weird combination, I was intrigued on how this combination would work. Unfortunately it doesn’t work as well as I would have liked. Ultimately the Perfection aspect of the game only adds two new mechanics to UNO. There is the timer which forces you to play tiles as quickly as possible. The timer mechanic wouldn’t be bad except for the fact that it just adds more luck to the game. UNO Flash also did a much better job adding a speed mechanic to UNO. The other addition is a new way to end a round. I didn’t care for this as it just adds a lot more luck to the game and rarely impacts the game anyways. Ultimately UNO Madness is a decent game but I would rather just play the original UNO and Perfection instead of the weird combination found in UNO Madness. If you don’t like UNO or don’t think adding a speed mechanic to the game is a good idea, UNO Madness is not going to be for you. If you really like UNO and like the concept though, it may be worth picking up the game if you can find it cheap. Adds a timer mechanic to the original UNO. The component quality is quite good. The "Perfection" mechanics only succeed at adding more luck to the game. You are better off just playing the original UNO and Perfection.